Severe dental injuries—luxations, fractures and avulsions—are rare and unexpected. 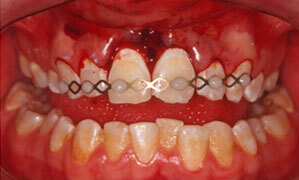 Consequently, a dentist confronted with such an injury will need accessible guidelines. In 2011, the International Association of Dental Traumatology (IADT) revised its trauma management guidelines that were previously published in 2007. A number of changes to the guidelines for permanent teeth will affect both treatment and medicolegal aspects of practice. The guidelines are available on the IADT website.1-3 A link is also included to the Dental Trauma Guide,4 that provides extensive diagnostic and treatment information, matched to the IADT trauma guidelines. Many of the changes to the 2007 version of the guidelines affect all serious injuries, but by far the greatest emphasis was on avulsion. Radiographic examination was previously specified to ensure that a minimum number of views were taken. However, efforts to reduce radiation exposure increasingly place the onus on the clinician to take the appropriate number and type of views. Diagnostic-quality radiographs are expected, although sometimes difficult to obtain in injured pre-adolescents and youth, as radiographs are important for both diagnosis and treatment planning. In addition, dental injuries often involve third-party assessors, who may request objective documentation of the injury. Routine antibiotic coverage must be weighed against the risk of unnecessary exposure. Currently, there is no evidence to support positive effects of systemic antibiotics on the outcomes of replantation. Pediatricians and pediatric dentists are increasingly concerned about unnecessary exposure to antibiotics, and the clinician’s decision should be based on the individual case and consider specific medical conditions. Splint type and duration of use vary according to the outcome sought. If periodontal ligament (PDL) regeneration is the expected outcome, then light wire splints for a short duration (up to 2 weeks) are recommended. If ankylosis and root resorption is the expected outcome, then the duration is increased to 4 weeks and the rigidity is less important. If a root is fractured and secondary healing is the expected outcome, then the duration and rigidity of splinting are similar to that when ankylosis is expected. At the Hospital for Sick Children (SickKids), we use a composite resin, orthodontic wire splint or a titanium trauma splint. This revision clarifies the fact that, at the time of injury, cold and electric pulp testing may give unreliable responses. Follow-up is required to make the diagnosis of non-vital pulp and at least 2 signs or symptoms are required to confirm pulp necrosis. The revision is the first guideline to emphasize that not all teeth should be replanted. Reasons include severe caries or periodontal disease, non-cooperative patient, severe medical conditions, such as immunosuppression, and severe cardiac disease. Other factors that were not mentioned are unfavourable crown–root ratio, severe malocclusion in a pre-adolescent, extensive comminution of alveolar bone or failure to obtain parent or guardian consent. Once again, it is stated in the guideline that primary teeth should not be replanted. Although avulsions represent only a small proportion of dental injuries, avulsion–replantation issues were the focus of the most attention in this revision. Healing of a replanted tooth can only occur by repair or PDL regeneration. In the first case, the outcome is ankylosis and root resorption with infra-occlusion of the tooth, if the patient has not completed his or her adolescent growth spurt, and later extraction of the tooth. In the second case, the outcome is a tooth with some areas of damage, but a largely functional PDL and normal survival. The avulsion guideline continues to base treatment on root maturity (incomplete or complete root formation) and the state of the PDL adherent to the root. The avulsion task group defined replantation within 5 minutes as immediate and from 60 minutes onward as non-viable (necrotic PDL). In the period between 5 and 60 minutes, root-surface PDL cells are viable but compromised. If a tooth is replanted at the accident site, subsequent treatment is splinting. If root formation is incomplete, the clinician can elect to monitor for possible pulp revascularization beyond 10 days. Otherwise, root canal treatment should be initiated within 10 days and before splint removal. A dentist may replant teeth between 5 and 60 minutes after avulsion (subject to the cautions described) followed by root canal treatment within 10 days for mature roots or observation for pulp revascularization in immature roots. If extraoral duration is longer than 60 minutes, the tooth receives root canal treatment and splinting regardless of root maturity. The 2007 and 2011 guidelines both note that immediate extraoral root canal treatment before replantation is an alternative to waiting up to 10 days. The goal is to prevent inflammatory resorption, and human outcome studies have shown this technique to be effective. The 2011 guideline now cautions, “The risk of infection-related [inflammatory] root resorption should be weighed up against the chances of revascularization. Such resorption is very rapid in teeth of children. If revascularization does not occur, root canal treatment may be recommended.” This risk of rapid root resorption and patient discomfort is the reason we do immediate extraoral root canal treatment before replantation in the pediatric population at SickKids. We believe that the most important issue is the critical extraoral duration before root surface stem cells in the PDL lose their ability to reproduce, differentiate into fibroblasts and produce functional PDL (regeneration). Simply proving PDL cell vitality does not guarantee regeneration of PDL. There seems to be agreement on removing necrotic PDL tissue from the root side, but the ideal method has not been determined. We have shown that almost half the PDL is torn from a tooth at the time of avulsion. Denuded areas become sites of ankylosis and resorption, but there is no evidence for or against leaving necrotic PDL on a replanted tooth. Before replantation, parents are informed that it will be a temporary measure designed to restore normalcy, one of their main wishes. This provides time to arrange an orthodontic consultation and for the growing child to come to terms with the eventual loss (extraction) of the tooth or teeth. Dr. Kenny is an honorary consultant, department of dentistry, The Hospital for Sick Children, and professor of dentistry, University of Toronto. He was a director of IADT and a task group member at the time of the 2011 revision. He is now associate editor, section on pediatrics and orthodontics of the journal, Dental Traumatology, and a member of the Dental Trauma Research Unit of The Hospital for Sick Children, Toronto. DiAngelis AJ, Andreasen JO, Ebeleseder KA, Kenny DJ, Trope M, Sigurdsson A, et al. International Association for Dental Traumatology guidelines for the management of traumatic dental injuries: 1. Fractures and luxations of permanent teeth. Dent Traumatol. 2012;28(1):2-12. Andersson L, Andreasen JO, Day P, Heithersay G, Trope M, DiAngelis AJ, et al. International Association of Dental Traumatology guidelines for the management of traumatic dental injuries: 2. Avulsion of permanent teeth. Dent Traumatol. 2012;28(2):88-96. Malmgren B, Andreasen JO, Flores MT, Robertson A, DiAngelis AJ, Andersson L, et al. International Association of Dental Traumatology guidelines for the management of traumatic dental injuries: 3. Injuries in the primary dentition. Dent Traumatol. 2012;28(3):174-82. Copenhagen University Hospital and the International Association of Dental Traumatology (IADT). Dental trauma guide; 2010. Available: www.dentaltraumaguide.org (accessed 2012 Jun 25). The Hospital for Sick Children (SickKids). Resources for Dentists. Available: www.sickkids.ca/Dentistry/Resources/index.html (accessed 2012 Jun 25).